Director Spike Jonze (Being John Malkovich and Adaptation) may not be the most prolific of directors, but he’s certainly among the more adventurous members of the breed. This time out, Jonze tackles a 1963 book by Maurice Sendak. 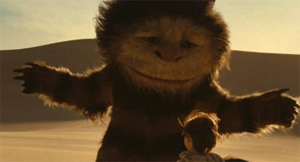 In making a live-action version of Sendak’s Where the Wild Things Are, Jonze either sags or soars, but he deserves major credit for hitting notes that are unusual for a children’s film. As sad as it is silly, Where the Wild Things Are tells the story of a boy’s adventures in a fantasy land occupied by creatures who are large, furry and who look a lot like they’re being played by actors weighed down by suffocating suits. I’ve read that the wide range of facial expressions displayed by these beastly wild things was achieved with computer-generated help. Whatever made their mouths move, these hulking creatures tend to grow on you. We accept them as living, breathing characters who don’t always get along and who are looking for someone to save them from the plague of existential loneliness. I know. This is a kid’s movie, but that didn’t stop Jonze from trying to infuse it with the kind of thematic depth that crops up in Sendak’s work. That’s where the boy — Max by name — comes in. As played by Max Records, Max can be both annoying and cute. He moves quickly and sometimes heedlessly. He can veer out-of-control in the way that kids sometimes do, a pivotal point in development of the plot. Jonze sets up the movie by showing Max’s ordinary life. He lives in a suburb with his working mom (Catherine Keener). Early on we learn that Max has a mischievous streak, that he’s capable of being hurt and that he acts out as a way to gain his mother’s attention. When Mom (divorced, we presume) shares a glass of wine with a boyfriend (Mark Ruffalo), Max flies into a rage, runs out of the house and heads for the woods. There, he discovers a boat that takes him across a vast sea to the fantasyland where he encounters the creatures whose voices are supplied by a stellar cast: Lauren Ambrose, Chris Cooper, James Gandolfini, Forest Whitaker and Paul Dano. These creatures anoint Max, clad in an increasingly dirty cat’s costume, as their king. In turn, Max receives a lesson about the abuse of power and the inchoate yearning for family structure. Initially, Max seems to have found a paradise that allows him to vent his wildest urges, but when he instigates a war — fought with flying dirt clods — he begins to see that his newfound liberation has an ugly downside. No need saying more. Unlike its source, Where the Wild Things Are may not be destined to attain classic status. But it’s a freewheeling children’s picture that tries to honor the delightfully idiosyncratic nature of Sendak’s tale while breaking out of an overly cute conventional mold. It may not be totally Sendak, but it’s close enough.